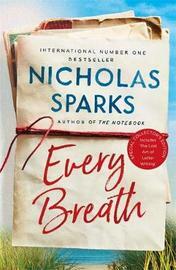 14.29% of people buy Every Breath and See Me ~ Paperback / softback ~ Nicholas Sparks. From the number one bestselling author of The Notebook and Two by Two comes an unforgettable tale of enduring love. There are times when destiny and love collide. This story is one of them. Hope Anderson is at a crossroads. After six years with her boyfriend, she is no longer sure what she wants, and when her father becomes ill she heads to her family's cottage at Sunset Beach to make some difficult decisions. Tru Walls has been summoned across an ocean from where he was born and raised in Zimbabwe by a letter from a man claiming to be his father. In journeying to Sunset Beach, Tru hopes to unravel the mystery surrounding his mother's life, but the letter will lead him in an unexpected direction. When these two strangers' paths cross, their chance encounter sets in motion a heart-breaking story – one that will transcend decades, continents and the workings of fate.